Metropolitan Bishoy: Memory Eternal ! It was with much sadness that the British Orthodox Church heard of the sudden death from a heart attack on Tuesday, 2 October of His Eminence Metropolitan Bishoy of Damiette, aged only 76 years. He served as General Secretary of the Coptic Holy Synod from 1985-2012, until the death of the late Pope Shenouda III. When the British Orthodox Church entered into union with the Patriarchate of Alexandria in 1994, Metropolitan Bishoy played a leading rôle in drafting the Protocol of Union and proved himself, over the following years, to be very supportive of Abba Seraphim and his ministry. Like Abba Seraphim, Metropolitan Bishoy, lost his father at the age of four and was brought up by his widowed mother and also, both were consecrated to the episcopate in their thirtieth year. As scholars and theologians with teaching experience they also shared a love of writing and lecturing to promote the Orthodox Faith. Abba Seraphim recalls with delight meeting Metropolitan Bishoy’s mother and aunt and also the occasion when he and his own mother welcomed Metropolitan Bishoy to the Church Secretariat and Library at Charlton. Although by training a Mechanical Engineer, who taught in the Faculty of Engineering at the University of Alexandria, he was also active in the Sunday School movement, where he also taught in the districts of Bacchus and Sporting in Alexandria. In early 1969 he entered the Syrian Monastery (Deir Al-Sourian) – the same monastery to which Abba Seraphim was later admitted – and was professed as a monk, under the name of Father Toma El-Suriani, before being ordained to the priesthood in 1970. Two years later, on 24 September 1972, whilst he was only in his thirtieth year, Pope Shenouda consecrated him to the episcopate to serve as Bishop of Damiette, the region where his family had lived for many generations and who had produced the martyr, the deacon Saint Sidhom Bishay (died 1844), whose relics now rest in the Cathedral at Damiette. When President Sadat imprisoned leading Coptic clergy who were loyal to Pope Shenouda, Bishop Bishoy also served a prison term of several months in 1981-82 before being confined to a monastery. In 1985 he was permitted to resume his duties and returned to Damiette. 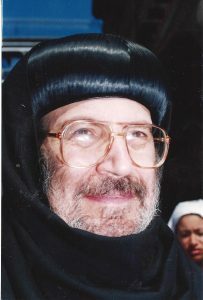 Metropolitan Bishoy was a leading Coptic scholar and theologian and in recognition of the important rôle he played in inter-church dialogue, especially that between the two families of Orthodoxy, Pope Shenouda elevated him to the rank of Metropolitan in 1990. His ministry was distinguished by his unwavering loyalty to the late Pope Shenouda and his fidelity to the Orthodox Faith as witnessed by the Coptic tradition. As a traditionalist he never ceased to expose teachings and behaviour which undermined Orthodoxy by his writings and through using his influence as Secretary of the Holy Synod. Abba Seraphim has directed that memorial prayers should be offered in all British Orthodox churches for the next forty days and that there should be special prayers on the fortieth day, which happens also to coincide with Remembrance Sunday.